Last night, I got home from work and had to muster up every ounce of energy I had to whip up a cake and pop it in the oven. We are having my dad over for Easter dinner tonight (Good Friday) and I’m making birthday cake for dessert. April 19th will be my dad’s 78th birthday! I decided to make a Chocolate Layer Cake. This is one of my favourite recipes, and it always works! Except for last night. What a perfect time for a cake to flop – it coincided perfectly with another rare and untimely event – I ran out of flour! Yep, I was so relieved when I scraped up just enough flour from the jar to make the recipe in the first place. I literally have no more than a few teaspoons of white flour in the house and its Good Friday, one of the only days in a year when stores are actually closed for the entire day. I’m famous for having to “re-do” things, but I simply didn’t have the time or energy to pull it off this time. Instead, I thought of a creative solution to my predicament. I had whipped up a double recipe of my favourite chocolate cake recipe and popped it in the oven.I knew that a single recipe was not big enough for two round pans, but the double was a bit too much. I should have taken some of the extra batter and made a few cupcakes, but I was honestly just too lazy. I knew the cakes would need additional time, because of the additional batter, so I wasn’t surprised when the cakes weren’t cooked in the suggested 30 minute bake time. I have always felt that my oven is a bit out of sync and that the actual temperature is a lower than the setting. I sometimes set the oven a few degrees higher to compensate, but I was too tired to think of this. After the first check at 30 minutes of baking time, I proceeded to set the timer in 5 minutes intervals to stay on top of things and not over bake the cake. I continued to bake and check regularly for what seemed like forever. I was totally exhausted and just wanted to go to bed. Finally,after what I am guessing was more than an hour of bake time, I tested the cakes and the poker came up clean – finally! It was not until I went to remove them from the oven that I realized that the oven really didn’t seem that hot. Well, that’s because sometime between the original 30 minute timer and the time I removed them, I must have turned the oven “off” instead of the timer. Ugh! Within 10 minutes both cakes had sunk ~ one not so bad, as it must have had slightly less batter to begin with, but the other would have made a a great cake if the party theme was “sink holes”! I decided to cover them with a towel on the cooling rack and deal with it this morning. I used the bottom of the “good” cake as the base for the layer cake. I frosted this layer. I then took the “bad” cake and scooped out the center of both pieces. I took the cooked outer “ring” of cake and placed it on the bottom frosted layer. I frosted the top of the ring. I then took the other outer cooked ring of cake and broke it into pieces. I mixed the broken cake pieces with the remaining filling/frosting and filled the center of the ring. I then added the final layer which was the top of the “good” cake and completed the cake. When all was said and done, I had to toss about 1/4 of the cake or the equivalent of one layer. My final cake is a 3 layer cake with this yummy filling in the middle. You can’t tell at all from the outside and no one would ever know this was not the original plan. (I don’t think my dad reads my blog, so I’m pretty safe.) So, Good Friday birthday dinner will take place after all! Here is the cake with sink hole in the middle. This is the bottom of mushy cake. Here is the top with the mushy middle that I had to scoop out and toss. Here is the salvaged outer ring of cooked cake. Other outer ring was broken into pieces and added to the remaining filling. Frost ring and then fill inner ring with mixture. Here’s a shot of the finished cake. 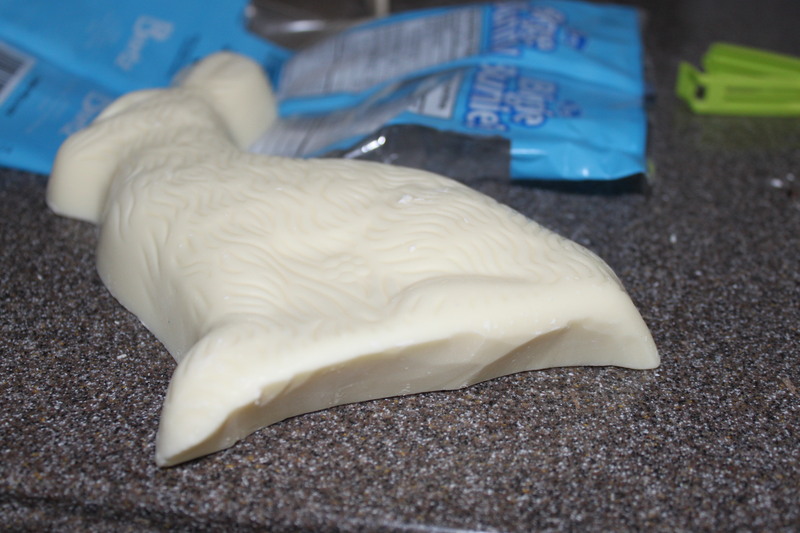 This white chocolate bunny provided the chocolate curls needed for the finishing touches. I had originally planned to post the recipe for this Mocha Cake and will eventually share it. It has a whipping cream frosting and I added white chocolate curls for a simple look. Just because things hadn’t gone so smoothly with this cake, I was sort of expecting to come up empty when I checked the crisper for white chocolate. I was only disappointed for a moment and then got a twinkle in my I remembered that my kids “smugly” informed me they no longer believe in the Easter Bunny. This ended up being a life saver! I didn’t even feel bad when I opened up the white chocolate bunny and sliced off the bottom of it for chocolate curls. I wonder if they’ll notice that the bottom of the bunny is missing and that the bag has been taped up? Posted on April 18, 2014 by Cindy Roy •	This entry was posted in Cakes and Desserts, Life Hacks, Recipes and tagged baking tips, cake disasters, how to salvage a flopped cake, life hacks. Bookmark the permalink. Looks perfect. Hope you all enjoy it and your Dad has a happy birthday. Cindy you are so resourceful.